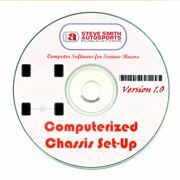 This program WILL set-up your chassis! It calculates for you: Proper spring, shock and anti-roll bar rates for your car and track, correct left weight, rear weight and cross weight, optimum chassis set-up after you make weight, spring rate or cross weight changes, front roll center height, CGH, minimum tire stagger, proper final gear ratio, ballast weight placement, spring rate of a coil spring, leaf spring and anti-roll bar, required spring rate for a fifth-coil, roll couple distribution, and more! The program holds files for 120 cars. It will print to your printer or display on screen. Useful for any racing vehicle running on an oval track - stock car, sprint, modified, etc. - dirt or paved. This is the set-up program you need to get dialed-in. Comes with a complete instruction and documentation work book.